Welcome to Global Entrepreneurship Week 2017. To celebrate we are offering 7 free webinars over 7 days tailored especially for rural Australia. Buying a Business: Start Ups are a great way to get into business but they aren’t the only way according to Michael Kerr from Kerr Capital. Why not buy a small to medium sized business? And your dream business may not be listed for sale but very available. Find out why as Michael takes us through five steps to consider when buying a business. Founder of Kerr Capital which started in 2002, Michael champions small business ownership and works with both sellers and buyers at all of the different stages of the small business ownership life cycle. He provides advice and services covering business sales, business valuation, business exit planning, business improvement, and buying businesses. Michael has a B.Comm, University of Melbourne (1985) and a MBA, Melbourne Business School (1999). He is a member of the Australian Institute of Business Brokers and a Registered Business Valuer. Overcoming start up barriers: Got a great business idea but the challenges seem overwhelming? Maybe its not as hard as you think? The next generation of our family getting involved in small business. GROWING up in a small business family is a valuable learning experience that arguably puts young people ahead in life compared to those not connected to business. Children with parents in business learn how to handle money and develop a range of valuable skills not taught in any school classroom. Most of all, they learn how to be good citizens. Here are five valuable lessons I learnt along the way. As children in a small business, my siblings and I understood the concept of billable hours and why in summer, at the peak time of his earth moving business, we rarely sighted our father. He was gone before daybreak and home long after dark. Paperwork was done after dinner. Quite simply, if he didn’t go to work there would be no revenue generated. Later, when the business became more established, the hours were less punishing but he still had to organise work for employees so they could be productive. This is the same for every small business. If the shop isn’t opened, the clients don’t receive a service, or if the crop isn’t sown, there is no return. Listening to adult conversations around them children instinctively develop an understanding of cash flows and budgets. There is an awareness of how the food on the table and the luxuries in life are connected with how well the business is performing. A good week in the shop, payment by a major client, or a wool cheque in the mail will be celebrated with smiles all round, but always with the understanding that most of that profit will go to paying the suppliers and investing back into the business. Children learn to understand the ramifications of customers who, with no conscience whatsoever, continually avoid paying their account. They also observe how hard their parents work to ensure that their own suppliers are paid promptly, or at least have the courtesy to make a phone call to explain when circumstances are beyond their control. Goodwill is an incredibly important for any business. Businesses understand the importance of supporting each other as a customer, as well as sponsoring local sporting clubs and charities. While we couldn't support everything, I was always incredibly proud that our family business did their bit for our community and have done the same in my business. In the early days of the business our mother was very hands-on so we also took on a number of chores. Answering the phone politely and taking messages was an accepted way of life as was fuelling the work vehicles each evening. We learned to safely handle equipment and vehicles at an early age. Getting our driver’s licence was accomplished with ease compared to our city counterparts who had never sat behind a wheel. Despite the tough times we always thought we were lucky, and we were. Growing up in a small business led to a confidence in our own abilities. We also learnt to be good citizens. Young Start-Ups: It never hurts to ask! 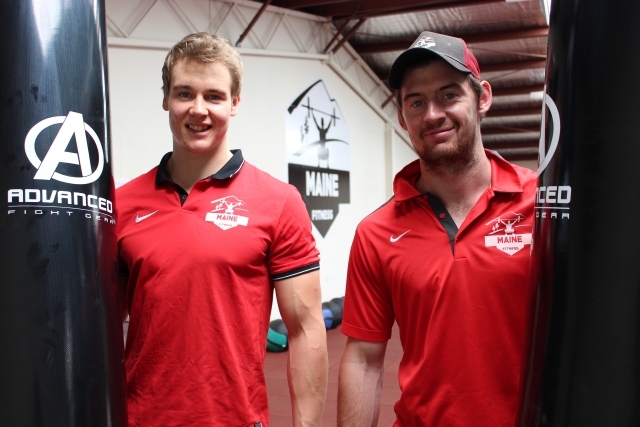 CELEBRATING the first year anniversary of a new business has been a major milestone for 23 year old Edward Coulthard and 24 year old Dale Hansford, co-owners of Maine Fitness located in a newly refurbished industrial shed in Castlemaine, Central Victoria. While one of their 220 current members is doing impressive chin pull ups on a bar across the room, my brain is doing mental gymnastics and I’m bursting to ask the question. How on earth were these two young men able to afford the start-up investment in a quality venue and equipment not to mention marketing to grow a membership? Specialising in an industry they are passionate about, it appears that this enterprising pair has invested significant time but minimal capital into approaching and building the business in a smart way to make it affordable and successful. Back in late 2014, the concept of Maine Fitness moved into overdrive when the local newspaper featured an article on local businessman and property owner, Glenn Guest. Glenn was publicly announcing his intention to refurbish one of his properties, an industrial shed, for the purpose of a new modern gymnasium. Edward was devastated as this was also his vision and he had been working hard and saving for this very purpose. He and Dale had only just started to scope out another potential site for a gymnasium. With both young men previously growing up and playing sport together in Castlemaine, and both having worked in Melbourne in the personal training industry, it was a logical decision to pool their expertise and capital to enable them to live and work in their home town as business partners. However; after reading the article, it seemed like their plans needed to be revised. “I knew that it would be difficult to compete with a gym of this size,” says Edward. That was until a game changing conversation took place. Edward’s football coach approached Glenn on their behalf and it turned out that he was open to proposals. With the opportunity to fast track their business idea, Edward and Dale quickly put a proposal together. 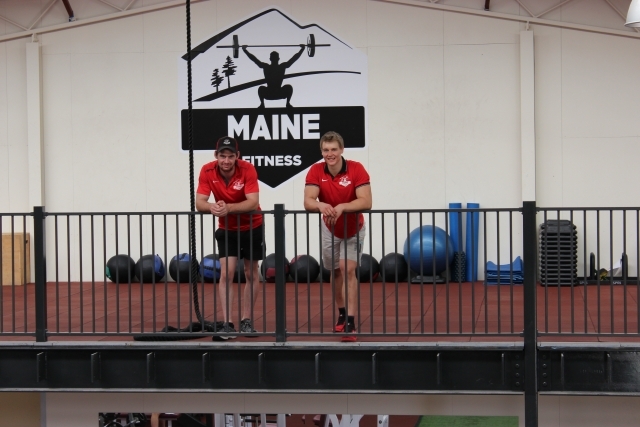 Maine Fitness was suddenly in take-off mode! Having secured the perfect venue, the next challenge was to fit it out with quality gymnasium equipment. “Once again, leasing was the best option for us,” says Dale. With a tight three month schedule until the proposed opening date the two new business partners and their landlord threw themselves into ensuring the facility was ready for opening day. Family and friends happily helped out assembling the equipment in the final few weeks. “It was crazy,” Edwards grins. With opening day approaching and funds flowing out of their limited bank account, they came up with another great idea. Facebook has proven to be the most cost effective promotion of the business. Now that they are operational, word of mouth recommendations are equally powerful and their membership has grown to 220 in just twelve months. In early 2016 the Victorian Drug Free Power Lifting Association conducted a novice event at Maine Fitness citing it as one of the most successful they had held with 20 participants and over 100 spectators. “Following this success the Central Victorian Power Lifting Championships are going to be held here on 4 June,” Edward says. “It’s going to be huge.” Already they have secured sponsorship from another local business, Centre State Drilling, to support a local lifting team to participate. Open seven days a week, Edward and Dale work full-time in the business sharing the duties with three employees. With high energy levels that I can only vaguely recall from my youth, both are working long hours. They also invest heavily in continually updating their skills attending courses all over Australia. While feeling very satisfied with the results so far, Dale admits that he is looking forward to growing the business to the next level when they can step back a bit more. Reflecting on how this model business has evolved so quickly and successfully under the leadership of two young men, I can’t help but be amazed. It certainly didn’t hurt to ask when a huge obstacle was presented to them. A simple conversation has produced a wonderful and mutually beneficial outcome. If I could do a backflip or even a chin up in celebration, I would! SHARE YOUR STORY: Have you or your community assisted a business to start up in your town? I'd love to share your story in my forthcoming book, Entrepreneurship: It's Everybody's Business. CLICK HERE to email me through the contact page.